Find answers to your questions...but contact us if you cannot find the answer you seek! CRM is a software solution that manages all interactions between a company and its customers in a single database where the company's users access the central tool with their personal user ID which defines their authorisation role. Managing all data about customers, providers, products, services, and any related transaction in one place allows to better understand the needs of clients and anticipate them. All data about contacts, products & services, and their transactions being stored in one central place, allows for the users of CRM to access the data and anticipate the next steps understanding the history of each element. Nowadays CRM has become a very wide concept whereas it goes beyond the management of customers and the interactions with the same, it also handles the internal management of the company, their web presence and all needs for digital marketing: one solution that does it all. Thanks to a good CRM that's made for Real Estate from the ground up, you can control all actions carried out on clients or potential customers, manage portals and websites, internal staff, and control commercial actions leading to a better focus and follow-up, resulting in a tight commercialisation cycle which is guided and documented. Companies that use CRM solutions generate more sales opportunities, streamline management, with updated budgets in real time and optimised best business sales processes. Therefore companies that use CRM can make better targeted segmentations, and benefit from the information for a potential customer service and after-sales service. What's CRM for Real Estate? The need for verticalisation of CRM solutions is key to the practical use and success of a real estate business since the way clients, collaborators, products and services are dealt with in this vertical is very particular. More than in many other verticals, real estate is a volatile market in many places worldwide, with extremely high competition in a great deal of those markets, and often saturated with real estate agencies that are after the same clients and representing the same products. The need for distinguishing the services and products for a real estate business are the key to obtaining the clients for whom it's a maze to find the right partner in the market of their interest, especially since often that's far away from where they reside. With the internet being a blessing to do in depth research of a future purchase or rental, it's at the same time a curse for both clients and real estate businesses alike as supply is plenty whereas often it's very hard to distinguish pros from amateurs, as to whom contact for the identical property in offer. Communicating properly the real estate business' identity, services levels and products can be a challenge when not possessing the tools to effectively reach their target markets. Therefore real estate CRM must go beyond the conventional functions and extend to integrating with various websites and property portals. Such integrations need to go beyond the automatic exportation of properties whereas a bi-directional connection enables the auto-importation & creation of potential clients or leads. Real estate is also a very broad term covering many property types (residential, commercial, industrial, etc.) and transaction types (resales, sales of new constructions, commercialisation of projects, residential long term rentals as well as holiday rentals requiring an integrated booking system, management of cleanings & maintenance, commercial leases, etc.). Furthermore the real estate industry is in constant and rapid evolution catching up with the backlog on other industries, especially in the technology and automation areas. Making the right choice for the CRM solution & business partner greatly impacts the future growth & development of the real estate business itself. New trends and changes in markets must be flexibility dealt with in the CRM solution and its support structure. 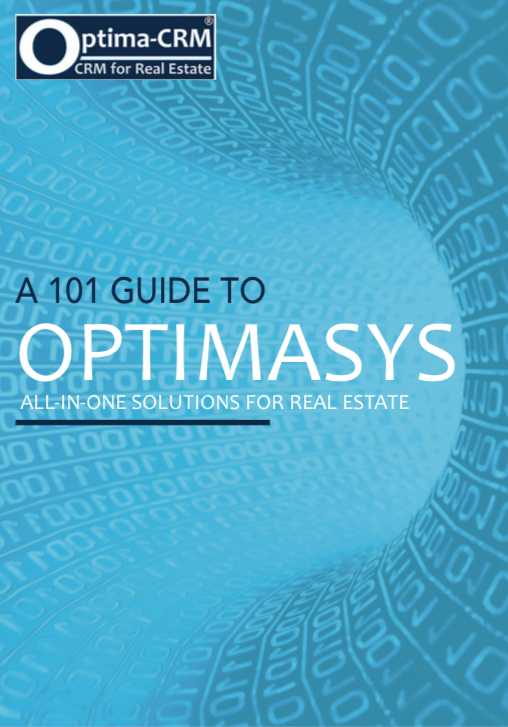 OptimaSys greatly addresses all these elements (and many more) through its innovative Optima-CRM solution for real estate agencies & promotors. Besides its far advanced technologies used, broad basis of real estate types & transaction types, it offers an all-in-one solution covering all possible technology & digital marketing needs. Besides the CRM solution, businesses count on OptimaSys for all their websites, email, and digital marketing needs such as SEO, SEM and social media management. 10 Reasons why I need CRM for my business? Does my business consist of at least 2 persons? If yes, you need to make data available in a central manner whereas CRM is likely the right answer. Do I want to be able to compete with the many competitors my target clients can find online? If yes, you need a CRM that handles your online presence better than most of your competitors do. Does my company commercialise more than 25 properties, whether own listings or from other agencies? Quantity is almost irrelevant as from a small number of properties you'll need to manage them centrally. Do I import properties from colleagues or portals into my commercialisation portfolio? If so you need a CRM system that allows for such automated importations to centrally store all properties to commercialise as all are your own listings to the outside world. Do I publish properties to my website & other webs like property portals? Being able to automatically publish your properties not only in your own website, but also in the many portals available, you need your main management tool to do this by itself + pull in leads from website & portals automatically (no emails copy/paste operations). Do I typically close on a sale in the first contact or is it a longer process? 99% of all sales are the result of often an extended process that can take months and even years in some cases. Managing and staying on top of all details for the many potential clients you deal with require an intelligent real estate CRM solution. Is capturing new listings important for me? Unless you commercialise strictly other agencies properties for a fraction of the commission, capturing properties is essential and you need a smart CRM solution that handles this part of your business too. New technologies are available to outsmart your competitors as applied in Optima-CRM. Do I need relevant information available wherever I am? A central database of information must be accessible from any place, any device at any time. Having access by PC, tablet and smartphone must be a smooth experience and provide the relevant information and accesses. With optima-CRM for example you can list new properties straight from the iOS/Android app on your smartphone, saving you lots of time, paperwork and potential also from errors/forgetting. Do I need to save time for the more important things? Automation of activities is essential as to save time and to make sure nothing gets forgotten. With Optima-CRM's Event Sequences you pretty much guarantee that you nor your staff ever again 'forgets' a step in the process resulting in the loss of a client. Do I need to manage sales, rentals & holiday rentals? An all-in-one CRM solution that allows you to manage every step of a sale, rental contracts & payments, as well as bookings for short term rentals and the associated management of cleanings and maintenance, is needed. Optima-CRM is a specialised solution for real estate commercialisation companies of all sorts, operating in any market, dealing with any type of transactions and properties. The solution was built up from the ground based on the needs in the market and the lack of holistic solutions available; Optima-CRM is the result of literally many thousands of hours development and working with our clients to deliver a state-of-the-art solution addressing true & practical needs of real estate businesses. It's also the one solution that's the most in constant evolution, to adapt to new real estate trends and markets. With a solution that never stagnates, the all-in-one solution covers most likely every need you may have. Optima-CRM solution is much more than a Customer Relationship Management solution that efficiently manages your clients, both owners and buyers/renters, whereas it also deals with all other aspects of digital marketing, websites, portal integrations, email and calendar integrations. specialised in real estate, basically what we have done is create a CRM-MLS based on digital marketing (SEO, connections with any portal) and with integration to a Dow Jones platform (Factiva - base of financial data to investigate clients' backgrounds). Open infrastructure: Import from any source (property feeds of any sort, clients, owners, companies, history, etc.) + export to any system (same elements). Heavily personalisable: Customise your agency to your needs, hiding/showing modules, limiting contents, and adding/hiding values. Made for Residential and Non-Residential: Handle residential as commercial & industrial properties. Transaction types: New construction sales, resales, transfers, long term rentals, and holiday rentals booking system. SEO tools: Access all required tools to position all pages of your websites, also including properties & images. Collaboration: Create your own private multi-level MLS, ideal to collaborate between a group of comapnies, or even for franchising reasons. Marketing campaigns: Create landing pages for all your marketing campaigns based on several great templates we deliver for free and that are fully customisable. Useful integrations: Benefit from full synchronisation of emails so you can send/receive/reply from either CRM or your conventional email system, as well as calendars like Google & Outlook. Mailchimp integration saves you time, Factiva (Dow Jones) integration allows you to record searches within your Factiva account straight into CRM, Facebook Premium allows to create leads in real time when they are created, etc. Unlimited portals: Export to as many portals as you decide, whereas besides automatically feeding these portals (given they allow for this), we connect bidirectionally by importing leads automatically. Currently we connect to over 40 portals worldwide, adding new ones constantly with our built-in XML generator. Integrated CMS manager: Manage all contents of as many websites you decide from one central place in CRM. Besides the typical management of properties & searches, you can now also manage all other contents like SEO, non-property related pages, contact forms, translations, etc. Native iOS / Android app: The native app allows to access the relevant data on-the-go, to consult data as well as update your viewings, and even list new properties from your smartphone in real time into CRM. Franchises: Build your own Franchise Network with the tools specialised into this area within CRM. Manage all franchisees from the Master Franchisor. This works both for existing franchises as companies who want to build up their franchising network. Extensions: extensions allow to venture into new markets setting trends in your market via Co-Brokerage (network based marketing & selling where you control the network) and YoVendo (online agent for seller that need to market their property but want to see as For Sale By Owner). All tools are included! New technologies: Being newer in the market than the majority of CRM software has allowed us to create our solutions in newer technologies allowing a much better user experience, access to tools not available in older technologies, and time-saving features. Is Optima-CRM right for me? 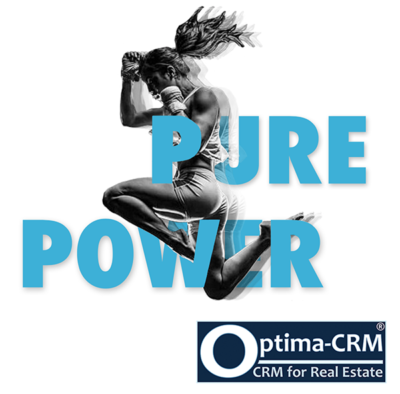 Unlike other generic CRM systems who have made adaptations to the real estate sector, Optima-CRM is built from the ground up with and for real estate businesses. To define whether Optima-CRM is for you, you need to fall in one of the 4 categories above, at least be a company of minimum 2 persons (no maximum is relevant), realise the need to better organise both internally as online, and wanting to beat your competition both online as offline. How does Optima-CRM optimise my day-to-day work? Optima-CRM is made to be your central management solution that allows you to manage all aspects of your business centrally. Being a practical solution, it allows you to better organise virtually all aspects of your day-to-day activities, both in the planning as the execution thereof. - CRM functions developed specifically for real estate: lead management, customers, owners, companies... Are all integrated with the properties database of the agency. Crossing data in real-time is standard so you instantly and at all times know which properties are relevant to a client, and which clients are relevant to any given property. - Management of internal and external teams: management of centralised calendars that are syncing with external ones like Google & Outlook Calendar, lead assignment, contact management, access by third parties, etc. - The essential processes of an agency for the sale and rental of properties: management of purchase offers & counteroffers and the sale itself (all steps through notary & post-sales), bi-directionally export to portals (virtually any), importation of properties from any property system, verification of customers with your account at Dow Jones Factiva database, send emails from the CRM (with properties, etc. ), etc. - An innovative MLS: connect and share between agencies with a multi-level logic where you discriminate who gets to see what much better than any other MLS, in one direction or in both. Set a private MLS networks is easy! - SEO: all elements of SEO are available for properties and projects, own and those shared by other agencies, in all chosen languages. In addition when you manage all contents of your website(s) via the built-in CRM, you manage all SEO elements for EVERY single page in any language too. - CMS (Content Management System): it is possible to manage your website(s) connected to the CRM, straight from the CRM control panel. An unlimited number of web pages can be connected to your CRM account. - Projects and properties: apart from individual properties, you can manage entire projects (banking, new construction, ...) and their specific characteristics, price lists, phasing with specific commission levels for each phase etc. - Uploading files: you don't need to reduce the sizes of images you upload, nor upload images watermarks as CRM handles all of this. It renders the images automatically in the right sizes that you need depending on where they are published. - Vacation rentals: apart from long term rentals you can manage the details of short term or holiday rentals. An integrated booking module allows to manage reservations, as well as maintenance and cleanings. Online reservations/bookings are madepossible, and there is even the possibility for third party access to the CRM (e.g. for cleaners). - Native mobile application (iOS and Android): an App made for agents on-the-go provides easy access to consult information, update activities & viewings with clients, upload properties directly from the smartphone saving lots of time and avoid mistakes, etc. - Landing Pages: you can create Landing page for marketing campaigns all integrated into the solution with several templates that can be fully managed for content. What do I need to implement CRM? Export data of properties, clients, owners, companies, and history to formats such as XML, XLS, CSV. Enrich and streamline data locally to avoid that your CRM starts off with bad or incorrect data. Import data into your CRM using available tools and mapping. Keep your current website and integrate it with CRM for property searches/display of results & details, as well as integrate contact forms to allow for auto-creation of leads. Keep the design (HTML) of your current site but replace its engine to benefit from the newer technologies & its native integration into the Optima-CRM CMS (Content Management System) and maintain all contents of the site from one central location. Create a new website from a custom design or based on one of the models available, benefiting from a new site that's natively integrated into Optima-CRM and its CMS. Every new system requires you to learn how to best benefit from its features to increase and speed-up its acceptation in your user’s community. You get trained on how to configure and personalize Optima-CRM to fit your company best + separately how to best use the solution. How much do I pay for Optima-CRM and what does it include? Accessing Optima-CRM requires a unique user license for each user for audit trail purposes. There are a variety of license types, depending on usage. Your internal staff uses what we call "normal licenses". External people having specific accesses to your CRM (e.g. maintenance people, vendors, clients, portal users, etc.) are different types and have other price levels. Pricing goes in scales, whereas the larger number of users result in lower cost per seat. A single user costs only 75€ (approx. $98) per month and 5 normal users are already available from only 250€ (approx. $300) per month. We can quote your licenses structure once we know how you will use CRM and which types + the quantity of users you need. Consult us for more details. Do I need to install any software to use Optima-CRM? No - Optima-CRM is a cloud-based solution that you can access from any device in the world via an internet connection. No need to install any software or be device-dependent. What types of Real Estate does Optima-CRM handle? Residential: villas, apartments, fincas, rural housing, studios, lofts, etc. Industrial: warehouses, car washes, offices, manufacturing facilities, etc. Commercial: hotels, commercial centers, shops, etc. Optima-CRM treats these real estate types uniquely in its own dedicated tables to make the property records fully relevant for its use. Other systems mix up irrelevant fields whereas Optima-CRM neatly presents the relevant fields to keep your inventory clear and to the point. Can I select which real estate types to show & hide others? Yes! Optima-CRM is a very personalisable solution which also allows you to decide which modules to show or not to your users. You can even make menus and moduels depend on the individual user as to a relevant display of functions depending on the role of the user. The best of it all is that all is included, yet you get to decide what to use and make available to your users. Do I pay more to use various real estate type modules? Not at all! Your licenses cover all our available modules. Use all the functions you need and rest assured that we got you covered for when you decide to expand and venture out into other types of real estate! What transaction types does Optima-CRM handle? Relevant API's exist to make all these transaction types available through websites. Can I manage holiday rentals in Optima-CRM? Yes! Optima-CRM has its own integrated holiday rentals module and booking calendar to manage the complex processes own to short term rentals. Besides being able to handle bookings, enquiries and owner blockings, all this can be integrated in a website so your visitors can initiate such transactions and even make online payments when we integrate your merchant account. Instant availability checks are available from within CRM as well from your website. To see an example of one of our client's sites, please visit costaandalucia.com. Can a property be both for sale and for rent? The same property can indeed be setup for Sale (or Transfer of a business) + Rent. Furthermore the same property can be for sale, for long term rent, and for short term (holiday) rent. No need to create multiple properties. Can we adapt Optima-CRM to our needs? Optima-CRM is one of the most personalisable CRM solutions for real estate where you can customise many elements and contents to match your needs. There are a whole range of settings at the agency level which impact all users within your company, and then there are a series of elements that can be set for any given user individually. Define which modules to activate or hide. Define how automated email notifications react. Set exclusions/inclusions for many data elements such as geo-locations to commercialise, property types to use, sources, building types, meeting & task types, property categories, lead statuses, and many more. Add and change values that are relevant to your business so that these values show in dropdowns. Set the languages to be used for content management in properties and projects for SEO etc. Email templates: change existing templates or create new ones, using the WYSIWYG editor or code in HTML, and use the available short codes to auto-populate values. Contract templates: create as many contract templates as you need in diverse areas in CRM, using an extensive set of short codes to pre-populate values upon generation of a contract. Set commissions for listing agents as well as for selling/renting agents, and make them dependent on whether the listings are exclusive or not, for predefined ranges of values, etc. Set default values for holiday rentals (deposit, security deposit, commission, bank accounts, etc.). Set watermark image and parameters for web, window card generation, etc. Decide whether people get to see other users' activities or not. Assign user roles to users. Connect to the company's Mailchimp account and lists. Connect to an individual external calendar account (Google and Outlook Calendar). Connect to an individual email account through IMAP to bi-directionally sync emails. Set the number of results to show on specific results pages. Set the graphical user interface language. Set the preferred defaults for showing properties, accounts, owners, etc. Does Optima-CRM allow the use of templates? Optima-CRM let's you personalise to fit your needs via the usage of templates. These templates can be created by you, or modified in case you would like to adjust templates provided by us. Contracts or Agreements: the integrated Contract Generator allows you to define agreements or contract with their relevant short codes for Sales transactions, Rental contracts & transactions both for short and long term rentals, listing agreements, representation agreements, offers/counteroffers, etc. Emails: here we distinguish internal system emails for notifications and emails you use to send to your clients and owners, renters etc. Optima-CRM has a wide array of email functions, whether auto-generated emails (property alerts, viewings feedback emails to owners,... for example) or manually created emails. Email templates can be created using the editor or in full HTML mode to achieve the exact layout results. Other examples include: notices of payments or deposits received, vacation booking confirmation, meeting confirmation, account assignments, event notices, sending emails to owners or accounts, property alerts, etc. Landing pages: Optima-CRM provides several smart landing pages (one-page websites) for your marketing campaigns (e.g. Google Ads, Facebook ads,...) which you can fully adjust to your needs and even optimise for SEO. Questionnaires: during viewings you can make use of questionnaires that you define, so that each viewing comes back with your questions answered. These results are stored for internal use, or can even be auto-added to automated emails for feedback to the property owners. They are also used in the commercialisation statistics of properties. Can I manage multiple offices or a franchise network? Optima-CRM is made to scale to the size of your business where you literally can manage a small business that consists of 2 or few people, or a larger business whether consisting of one or multiple offices. The 'Offices' function in Optima-CRM truly allows you to scale and organise your organisation (one legal entity) adapting all functions to the structure you have. Offices can be physical or virtual and all elements in Optima-CRM can be linked to one or multiple offices, allowing you to decide who gets to see which data. A user belongs to one Office, yet data (clients, owners, properties, and all other elements can be assigned to multiple offices enabling the elements to appear for one or multiple groups of users). There is always a Master Office where all data is always shown. Setting up multiple offices is not required, yet in many cases will allow you to configure your agency way beyond what any other CRM will allow you to do! The 'Franchising' solution does something very similar to Offices, but then across legal entities and agencies. Offices functions remain available for each of these legal entities/agencies as to extend that flexibility across the entire Franchising network you have or plan to build. Which automations exist in Optima-CRM? Create landing pages from provided templates and generate your personalised marketing campaign websites. Publish the page to any URL you control. Generate automatic leads from the contact forms in your landing pages. Event Sequences: Events are business process triggers that frequently happen in your business and that cause a series of activities to take place, either instantly or at predefined intervals (e.g. creation of new lead, property, sales, rental booking,...). Define sequences of activities that should be executed when an event occurs. Create as many variants as you see fit. Execute a selected sequence when an event occurs, choosing from the variants, and update the activities calendars from all the users selected for individual tasks & meetings, generating automatic email notifications and reminders via the central calendar. Save a tremendous amount of work + never again 'forget' to schedule and execute any task! Automatic Notifications: email notifications, reminders & the Notifications Center. Via the Notifications Manager you control the notification triggers and the associated parameters & email templates. Events & actions in CRM generate notifications, whether automated without user intervention, or based on a user action in CRM (e.g. assign Account to a user). Property Alert emails can go out to potential clients, based on the Account's profile and parameters, and in the selected communication language using the personalised email templates. 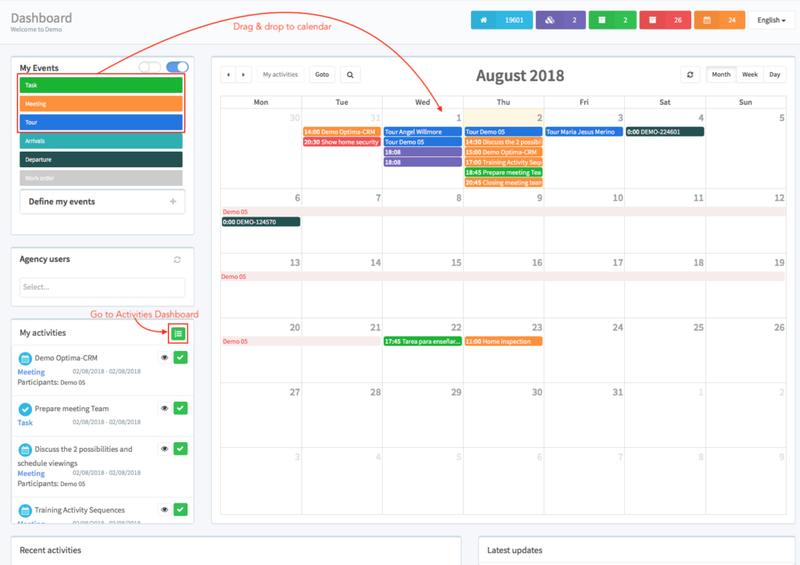 Activities are logged on the calendars of each individual user and at set times CRM will provide reminders, whether they are shown in CRM or in the connected calendar of the user (settings to define this). A running Notifications Center registers a whole series of notifications so you can stay appraised in real-time about price changes, new listings and much more. Mass Updates: Given the permission via the authorisation roles, a user could make mass updates to the database as to save lots of manual work. Update statuses of properties, set to Show on Web or not. Update Accounts & Owners: (re)assign quickly to users, update GDPR status. Mass add a list of filtered properties to a Portal. Copy properties assigned to a portal, to another portal with a click. Exclude all properties from being seen by updating the geo-locations settings, or for many other possible exclusions like property types. Reassign all activities from a former employee to another employee at once. Assign Owners to all users of an Office in one action. Define profiles of Accounts to what the individual is looking for. Instantly all Relevant properties matching their profile are shown. Create Property Alerts which send automated (pre-formatted based on your templates & languages) emails with newly added properties matching the Account's profile. Listing a new property instantly show all potential clients whose profile match the property parameters. Set property alerts for new properties added that match the Account's profile parameters. Configure the email templates for the notifications, based on thumbnail emails variants & the communications language of your client. Emails sending is depending on the Account's GDPR status. Easy setup for each user via standard IMAP connection. Syncs all emails from Inbox & Sent box. Sending, receiving, or replying can equally be done from within CRM or your external email client (Outlook, Gmail,...). Emails related to an Account or Owner (recipient or sender) are also stored in the History & on the Timelines of the respective contact in CRM. Never have to think from 'where' to send or reply an email anymore! Calendar synchronisation & Reminders: Integrate your Google or Outlook Calendar with your CRM user. Any activity created in CRM is also visible on the external calendar where it can be updated in both CRM and the external calendar to be synced. Reminders can happen in CRM and/or the external calendar. Besides the typical reminders, email notifications are generated. Draw on a live Google Map all the areas that you want to assign to your users so they can work the buildings and urbanisations assigned to them. Direct access to all available properties and sales in their assigned urbanisations. Easily reallocate and redraw areas. Portal Scraping: a technical method to 'read & interpret' the HTML of a website or portal, with the goal to identify new potential properties to list. A premium way to get your hands on new potential listings from owners publishing for sale/rent on portals. A great time-saver as well as way to beat your competition to be the first to propose your representation services. All enquiries from your website generate new leads in CRM without any manual intervention, including all details such as property they enquire about, contact info etc. Possibility to auto-create the account's profile to save you even more time. Our landing pages generate the same results from the pre-made contact forms. Portals are also connected bi-directionally where besides feeding your properties to your portals accounts, all enquiries equally create automated leads in your CRM. For existing accounts who enquire again, CRM is smart enough not to create duplicates but instead enriches the data of the potential client. Automated notifications alert you of new leads creations. Create as many contracts and agreements templates for your staff to use. Categorise contracts so they appear in the relevant sections of CRM (property listing, sale, offer, rentals,...). Short codes allow for the auto-filling of values in the contract so the user has a rich and complete contract by the click of a button, and all legal clauses remain in place. Preview the contract before generating it. Contracts are stored in PDF automatically. Select any of the 40 available templates. Generate window cards in any language you maintain, and for the transaction types you need (sales, long term or holiday rentals). Select the images before generation. Update texts and even price before generating. Auto-email window cards in PDF at time of creation. Download in SD (Standard Definition) or HD (High Definition) for print where CRM renders the appropriate photos formats. Comply with the law in Andalucia. Generate technical files of every property. Scheduled Properties Imports: import properties from any external source automatically and update nightly. Easily add imports from external systems so you can commercialise properties from other agencies instantly. Choose from any of the many XML formats available. Check the import logs so you know when the last import happened for each source. Select any of the 40+ portal formats available. Simply add properties to your basket created for each export. Activate and the export is scheduled and will run daily. Easily add new XML formats yourself if you like using the XML generator in CRM. MLS Sharing: a save way to share between members of Optima-CRM where YOU decide what to share and with whom. Sharing in CRM is by definition OFF so you have 100% control on what you share and get to see from other Optima-CRM member agencies. Multi-level sharing allows to create tree structures of classifying properties and agencies according to your definitions. Discriminate between agencies that makes sense to you. Allow for one-way or two-way sharing. Create your own private MLS network, ideal for franchising companies and companies collaborating with a well-defined group of companies. Mass emailing you do in the therefore built tools like Mailchimp, the largest and most used newsletters tool. Synchronise your contacts with Mailchimp one-by-one or massively. Segregate data of contacts by languages, and account profile parameters to create very targeted Mailchimp lists. Import contacts lists yourself via CSV. Export all or selected contacts to a standard CSV format. Are my conventional emails automatically synchronised with the CRM? Each user can setup the connection between the CRM user and the external email account in a similar way that the user connects the email account with an email client such as Outlook. Connecting your email account via IMAP to your CRM account makes that your Inbox & Sent boxes are synced 100% and in both directions. Furthermore if the sender or recipient is an Account or Owner in CRM, the email will also be shown on the respective record and in their Timeline so you have a full transparency of email communications. Practically this means that you can send, receive and reply to emails from either your CRM account or your conventional email (for example using Outlook or Gmail,...), and that the email sent or received will be both stored and available in CRM and your conventional email account. It doesn't get any better when you do no longer have to worry where an email is stored, or from where to send or reply to an email! Also attachments are stored in CRM so you have full access to the same information in your email account. Are there templates for emails? Optima-CRM comes with a series of pre-formated email templates that you can use and change to your needs. You can also add as many templates as you need and in any language you need them. Email templates are given a Type so they appear in specific screens and functions in CRM as to present the relevant templates to the function you are performing. The availability and usage of Short Codes (shortcuts to field values) make that your email upon generation gets filled with relevant data of the record you're handling at that time. For example, there are many short codes related to Accounts, Owners, Properties, Projects, Users, etc. Your email could start for example like this: "Dear [first-name]," and say "Dear John," in case the first name of your client is "John". You can even replace the automated email notification emails as to tailor them to your needs and in the languages you require. Find the Email Templates in the "Templates" menu. Does Optima-CRM generate automatic notifications? Based upon events or 'triggers' notifications are generated, which can be email notifications, reminders (calendar), or entries in the Notifications Center (alarm bell icon). Email notifications use email templates with short codes, whereas Optima-CRM provides the templates and you can update them to your needs, formats and languages. Reminders can be set to happen in CRM, in the connected Calendar (Google or Outlook), or in both. The Notifications Center stores a series of notification events where you can see what's happening in terms of property creation, updates, accounts assignments, sales etc. Does it create series of activities I can define on a specific event? You can define automation of activities based on 'event triggers' which personalises your CRM to the way you do business, detailed per event and with as many variants as you need. Events are business process triggers that frequently happen in your business and that cause a series of activities to take place, either instantly or at predefined intervals (e.g. creation of new lead, property, sales, rental booking,...). This is especially useful to schedule in one click all the activities that you or your team needs to execute a predefined time intervals, forcing users to be reminded of their activities timely. How does automatic mapping of properties with clients work? Optima-CRM constantly and in real-time maps available properties with accounts based on the accounts' profiles. This data crossing works bi-directionally whereas upon creation of a new account you will instantly see the Relevant Properties that match the account's profile, and the way around upon creating a property it shows instantly all Relevant Accounts whose profiles match the property parameters. Does Optima-CRM send property alerts to my clients? You decide whether a particular client receives automated property alert emails matching the profile parameters of the account. Those emails are based on email templates that you define, and in the language your client wants to receive the emails. It generates emails with thumbnails of the properties whereas the client can click and see the properties on your website. Are leads created automatically from an enquiry on my website or a portal? Enquiries from your website, any of your landing pages, or even the property portals you are publishing properties to, all generate automatically Leads in CRM. Can I import properties from other sources automatically? Optima-CRM is an open infrastructure platform that allows you to import properties from any source, MLS or feed provided by for example another agency. This allows you to commercialise other agencies' properties, even if they do not form part of the Optima-CRM network. Can Optima-CRM feed to the portals I use? Optima-CRM connects to over 40 portals worldwide and is adding new ones regularly. If the portal allows an automated feed, Optima-CRM can do it. Furthermore we connect to portals in a bi-directional way, which means that in addition to publishing your selection of properties to portals, the incoming enquiries from portals auto-create leads with all the information directly in CRM. No more copy/paste of emails from portals! Can I upload contacts from my old system? Also here Optima-CRM provides the tools so you yourself can upload or download contacts in/from your CRM account. How can I automate and manage activities? From the Main Dashboard Calendar: drag & drop activities onto the Calendar, view and update existing activities, etc. From the left Menu "Activities": access Meetings, Tasks & Viewings. 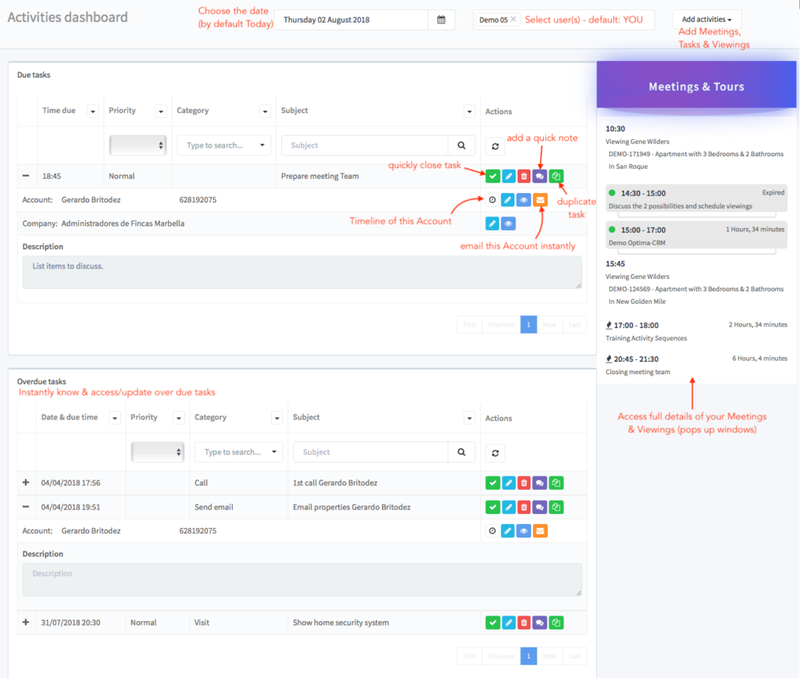 From the Activities Dashboard (via menu --> Today, or from main Dashboard icon in Today widget): complete control panel of all current tasks due + overdue tasks, meetings and viewings (tours) for the given date & user(s). This panel provides a visual calendar (month/week/day views) with search capabilities common to typical calendars. This calendar can be connected to an external Google or Outlook Calendar through user authentication allowing to synchronise calendars (see corresponding FAQ on how to connect your calendar). A user-friendly interface allows you to drag & drop activities to the calendar, causing a window to popup to enter activity details. Also on this Dashboard there's a "My activities" widget with my things to do today (and past due activities). From this widget you can easily navigate to the Activities Dashboard clicking on top right green icon. You can personalise your activities visibility with "Define my events" where you create your own named activities based on Tasks, Meetings & Viewings. You can see & access the activities of all users (unless authorisation settings limit access), filter on one or more users' calendars at a time. Does Optima-CRM handle Virtual Tours and 360º images? Virtual tours can be displayed on your website and are compatible with any device. You do not need any additional subscription to a third party tool and don't run the risk an API that could break with third party software. How can I automatically export properties to portals or for other reasons? The built-in Exporter allows you to export properties in a large variety of formats, to over 40 portals worldwide on which you have an account. The same exporter can also generate XML files to export selected properties in any of these format for other purposes, such as feeding websites of collaborators. We use the concept of Baskets, similar to how an online webshop works. you simply create a basket, assign a format, add properties, and activate. Every day at the same time this file will be updated with any changes you made to the basket or properties within the basket. You can even define the costs of portals together with the allowed quotas as to calculate the cost per property publication. Can I create Landing Pages for my marketing campaigns? Optima-CRM hosts a series of effective landing pages which you can fully configure to show the contents you need, and even configure the SEO elements so your Google A campaigns become more profitable. Landing pages are responsive and can easily be exported to be published on any URL you control. Enquiries that flow from your landing pages contact forms, create automatically leads in CRM. Can I manage my websites contents from within CRM? Optima-CRM custom CMS (Content Management System) allows for you to maintain every details of contents of your website right from within CRM. This way you can handle contents beyond properties, such as pages, menus and blogs, translations and images. This makes your websites even better and faster vehicles whilst you keep full control over them. Can I see what users are doing in CRM? Optima-CRM has a rich audit trail logic built-in which allows for many different ways to check and understand what your users are doing. User log: see when and from where users are logging in and out of your CRM agency. Deletions logs: see who deleted what and when. Excluded properties: understand why a property is excluded from your agency and contact your administrator to re-include it. Does Optima-CRM has some mechanism to identify duplicated properties? Yes - the Duplications tool checks in real-time potential duplicates based on a variety of parameters to identify and present possible duplications where you can decide whether to include or exclude these properties. Can I see the automated server jobs that are running? Yes - the CRON jobs tool shows you all the imports and exports that are automated and happen daily. Here you can check the last run times and detect if there is a potential issue with such import or export. This greatly help you to understand why data has not been updated timely for example. What types of connections to external systems are available? Mailchimp: The largest email marketing automation platform in the world is integrated to allow for creating and maintaining your targeted lists of contacts from within CRM to Mailchimp. Factiva (Dow Jones): this world famous company's Factiva provides a large database of natural personas and companies with regards to their financial behaviour. This database is used by many companies worldwide to deal with the laws against money laundry also known as 'Know your client'. When you have a subscription to this service, you can use it as an integrated part in Optima-CRM so it documents all your searches and due diligence in your CRM account. Dow Jones allows the delivery of relevant content for users, as its smart identifiers cover thousands of companies, organizations, regions and subjects. YoVendo: Online real estate agent solution built by us and as extension to Optima-CRM. YoVendo allows you to be an Online Agent for vendors who are looking for an alternative way to commercialise their property without representation of an agency. No matter how much effort an agency does, there is a substantial group of property owners who will never agree on paying commissions for representation in a sales transaction. Co-Brokerage Portal: We bring the power of commercialisation of your own development projects, or those you commercialise on behalf of a project owner, to real estate agencies & promotors, without the need for a custom software investment. Now everyone can become its own Master Commercialisation Agency and connect to a network of real estate agencies. Co-Broking is an extension made by us based on Optima-CRM. This solution allows your company to become a Prime Invest, Sotheby's International Real Estate, or any of the major competitors in the market. Websites: integrate as many websites as you want with Optima-CRM, with or without the use of the custome CMS (Content Management System). Google Maps: wherever addresses are involved + map drawing functions to search, assign urbanisations and define account profiles. Email integration: via IMAP or MS Exchange synchronise all your incoming and sent emails to contacts history and timelines. Calendar integration: Google and Outlook Calendar. Import from any property system or CRM: benefit from the open infrastructure and import from other systems, MLS and feeds. VoIP (Voice over IP): a project is underway to integrate the VoIP solution of MegaCall (more info to follow). How does Optima-CRM connect to portals? Optima-CRM connects bi-directionally to portals in a diverse way of methods.Bi-directional connection means that we not only automatically export properties to portals, but that enquiries made on a property in your portal account, create automated leads in your CRM account. The most frequent technology is via XML feeds where the feeds are automatically preparing a file of your selected properties in the XML format defined by the portal. In this case it's the portal that comes to read this file nightly and uploads/updates the details of your list into your account of the portal. Thanks to our XML generator, we can quickly add new XML formats whenever you need to connect to a portal we wouldn't already connect to. BLM files are a less frequently used format by portals yet also here we connect through our XML generator that can also generate these kinds of file types. Some of the more advanced portals use webkits and JSON formats which our team needs to create for our users. For several of the leading national and international portals we are already certified and connect our clients. Should I have an account in a portal to export? Yes - if you want to auto-export from CRM to a portal, you first need to have an account with said portal. Once you have the account, the setup is rather easy and even you can do this yourself following our instructions. Do changes I make in my agency get passed through the feeds automatically? Any changes you make to properties already added to a portal export will automatically update these properties in your feed, as long as the change has an impact on the data you send. For instance, if you change the price, photos, texts, or status of a property, then this will reflect instantly the same day in the portal when you make them prior to the cutoff time that you decided yourself when activating the export. You do not need to manually go update any property in the portal anymore. Can I manage my quotas for each portal I export to? Yes - in CRM you can define the quota per portal as well as the cost of it so you not only know whether you can export more properties but also what the cost is per property published. Do leads get created automatically when someone inquires a property on my website or a portal I publish on? Our bi-directional connection of your websites as well as portal connections result in the auto-publishing of your properties and the auto-creation of leads in CRM each time a new enquiry is created on any of your properties. When the account already exists in CRM, the system is smart enough to not create a duplicate but instead enrich the existing account. Can I export contacts straight into my Mailchimp account? Yes - you can connect your CRM agency with your Mailchimp account in real-time so that you can send selected contacts directly to the lists you select in your Mailchimp account, without leaving CRM. This is particularly interesting when you want to create mailing lists based on languages, profiles of interests, and other segmentations. Can I integrate my Factiva account in Optima-CRM? Optima-CRM is one of the only certified real estate CRM systems that integrates Factiva (Dow Jones) so that you can reflect your due diligence on your clients which is obligated by law for the compliance against money laundry. All your searches and results are stored in CRM so you maintain this audit trail for whenever in the future you would get audited on this hot topic. Is my email integrated with Optima-CRM? You can indeed integrate your conventional email account with Optima-CRM via a standard IMAP connection. This is a great advantage over many other systems as all your incoming and sent emails are synchronised between your CRM account and your email account. With this integration, you do not need to use any BCC fields, nor tag any contact in your email list. Since CRM syncs bi-directionally with your email, it 'recognises' when a recipient or sender exists in CRM so that the email is recorded on the account or owner's history and timeline. You can send, receive or reply any email from both in CRM as in your email client and both will be syncing teh other one. Never lose another email and reply from any device or software you are using! Does my Google Calendar integrate with CRM? Optima-CRM integrates both with Google Calendar as well as Outlook Calendar so that you will always have your CRM activities in your external calendars. Furthermore updating any activity either in CRM or your external calendar, will sync up both accounts. Can I easily migrate data from my old system? Optima-CRM receives new clients from a great variety of different systems. Examples are clients who come from Salesforce, FLG360, Highrise, Inmovilla, Inmofactory, Resales Online, Infocasa, Inmobalia, Witei, and many more. You benefit from all the projects we have created for other clients where the data conversion becomes much less painful. We can literally convert data from any source system. Which security measures does Optima-CRM provide? Safety First: we take Your Business serious too! We are responsible of safeguarding your data and take this very serious. To do this properly we have created the physical environments, applied the software solutions, and are 100% in line with legal legislations. Audit trails: Optima-CRM tracks any change to data made by any user, whereas you can review who changed what, when, from where, and what were the previous values. Authorisation levels: assigning roles to each of your users prevents from certain data being seen/updatable to users who shouldn’t access it. It also limits access to certain functions, and you can even customise agency settings to work in conjunction with roles. Data archiving: important data is not deleted but archived whereas the Agency Admin only can permanently delete (or restore) any archived data. This also avoid history loss. Data encryption: your data is safely stored by applying encryption so that no unauthorised access is limited to a minimum. Data mirroring & backups: we mirror the live database in real-time to avoid data loss in an event of hardware failure. Additionally, we take 6 times a day a full database backup so we can restore data within an average 2 hours frame. Failover system: load-balancing allows for better performance and whenever a hardware failure would take place, we can quickly switchover to another set of hardware so that the user experiences the least possible inconvenience. RGDP: we fully comply with all requirements of the strong data protection law where we have all processes in place to safeguard your data and the data you store in our solutions. Our solutions run on a large number of powerful dedicated servers that are physically located in more than one state-of-the-art data centers to also physically protect the software and data that we store. Applying the latest security patches and software version on servers level, guarantees you the best protection. A team of system experts constantly improves the environment and watches closely any irregularities to act before they become issues. Being a VIP client of OVH, one of the world's leading data centers, gives us access to VIP services not available to many software providers. Can I decide who can access which data in my agency? Through predefined user authorisation roles, in combination with a series of personalisation option, you decide which roles to assign to which users. Furthermore, within each of these roles you can decide to assign certain data elements so that some users of the same role do and others don't access that data. Besides user roles, the notion of Offices is a powerful element to structure your organisation and make virtually any element (un)available to persons assigned to certain Offices. Offices do not need to be physical as they can also be virtual for the purpose of data segregation. Now you do no longer run the risk that any of your employees one day run away with data that they should not be able to access in the first place! Does Optima-CRM make regular backups of my data? Data is constantly being backed up between two physically separated machines in a mirroring setup, which means that the same data is stored on two machines and databases. If one of the two were to crash, the other one continues to run with the same data. Six times per day we make an integral copy of all databases and store these safely in a different data center. Images are stored in a separate CDN to not interfere with the other data and where the storage is scalable for any unforeseen growth. Do I control access of my users? As the Agency Admin you have full control over your users, meaning that you decide which role they have (which data & menus they can access), whether their user is Active or not (if not, the user cannot access), see for all your users when they log in or out and from where (IP), as well as see who has made a change to any element in the system in the extensive Audit screens. Optima-CRM comes with all possible and relevant modules to run a real estate business, yet there are very specialised functions that are only relevant to specialised business. Such functions are handled in what we call 'extensions' are functions that extend the usage of the modules found in Optima-CRM, outside the CRM itself. Such extensions have very specific reasons of existence and deal with well-defined topics. Extensions require specific sets of licenses as they typically involve access to Optima-CRM through a protected portal, to consult, create, and update data stored in CRM. Co-broking portal to create your international network of agencies specialised in luxury international real estate, and who market in their local markets bringing their clients to your doorstep for a commission. What is YoVendo and how does it work? Your own FOR-SALE-BY-OWNER platform: YoVendo is a new source of revenue for you! What is the Co-Brokerage portal? We bring the power of commercialisation of your own development projects, or those you commercialise on behalf of a project owner, to real estate agencies & promotors, without the need for a custom software investment. Now everyone can become its own Master Commercialisation Agency and connect to a network of real estate agencies worldwide where you decide. Does Optima-CRM connect with a website & how? Optima-CRM can connect with ANY website through various methods. It allows for real-time connections where a website 'calls' CRM to search properties and CRM returns results lists as well as details of properties. Furthermore contact forms are integrated so that enquiries from your website automatically create new leads (or add to existing leads) saving you time and errors. Such leads carry all details the person transmits via your website, creating possible a profile of what they need at the same time. Leads can be both owners or buyers/renters. Rental enquiries & bookings can also be generated from a website, as far as allowing for online payments. This makes it possible to connect to an existing website or a new website that we can build for you from scratch, or based on existing models saving you time and money. You can choose from a series of models from which to start and create your professional website with all changes and options you select, and in any languages you need. When we create a new website, whether it's based on a model or from scratch, we completely integrate all elements of the website. 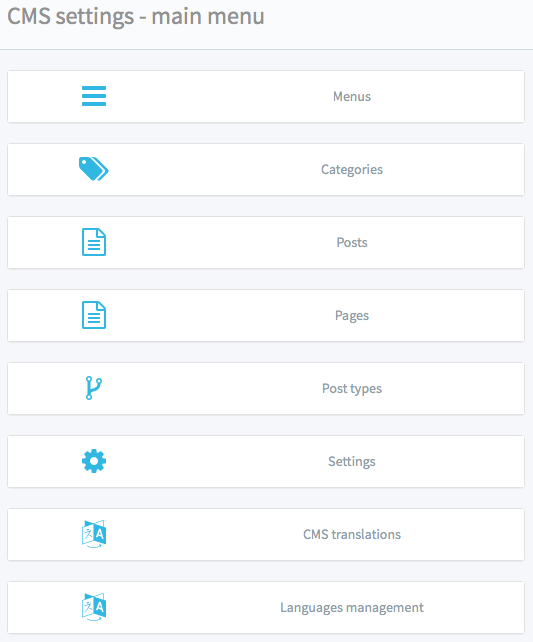 Besides the integration elements here above, we also connect all pages and blogs to the custom CMS (Content Manegement System) in CRM to allow for a centralised management of any content of our website. This also includes translations, images and contents of non-property related pages. Does there exist a WordPress (WP) plugin for Optima-CRM connection? Yes there exists a WP plugin for Optima-CRM. You can freely download and use this plugin at which point you can configure the settings for layouts and behaviour from the many possible combinations. Furthermore if you are a WP developer, you could use it as a base to customaise the coding of the plugin to fully match your needs. Can OptimaSys build my new website? OptimaSys has built far over 500 websites and has an extensive experience in design, programming and integrations with other systems in a wide array of technologies. We apply the latest technologies yet bearing in mind that for compatibility and SEO reasons, your site needs to be made of technologies that allow for this compatibility. Speed, ease of use, potential to rank in the search engines, and many other factors are taken into account. Can I choose the web style according to my taste? Absolutely! Tastes and colours depend each one's preferences and this we take very much into account when it comes to creating your new website. You decide how flexible to be in terms of designs, where we can go from designing your website from scratch starting with a blank sheet of paper, to basing it on one of our several available models. Your decision will influence the time to have your ready-to-go-live website and also the cost to develop it. We have create websites and brought them live in less than one week (which should only be done in cases of emergency for obvious reasons) and it can take as long as several months, mostly depending on the complexity of the site, the options selected, and the speed of making decisions between the designs we present to you. Talk to us and we'll give you some good guidelines to make the best decision. Can my website be in more than one language? There is no limit of the number of languages your website has. CRM allows you to maintain all contents in any language you define and maintain. Consult with us to know what additional languages can cost in your website configuration. We do not use an automated translation tools such as Google Translator plugins as this doesn't serve important purposes such as SEO positioning, nor the persons consulting your site in a language written by a robot (typically not grammatically accurate). Maintaining contents of a website nowadays has become much more of a SEO activity and a way to communicate 'in person' with your audience, which requires greater knowledge and expertise than before. Do your websites adapt to screen sizes and devices (responsive)? All our websites are built to show well on any device, browser, screen size and operating system. Our sites are fully responsive and go way farther than just that! Speed is a critical element of a website, whereas we apply latest technologies to encourage the navigation & loading speed of your website. At the same time we bear in mind that new technologies are great on newer devices yet on older devices and/or browsers those may cause issues. Also for SEO, Google needs to be able to 'read' your contents whereas sometimes with new technologies they have an issue with this. Therefore we use hybrid technologies to achieve all of the above! How long does it take to create a website and be ready for use? That's a tricky question...similar as "how long does it take to build a house and move-in?" But rest assured...it doesn't take anywhere close to building a house! Is it based on an existing model or is it a 100% custom-built site? What type of website do you need? A simple or complex one? Do you need only resales properties, or also new construction projects, long term rentals and holiday rentals bookings? How many languages do you want your site to cover? How interactive with moving elements do you need your site to be? How fast can you react when we ask you a question? Will you take part in the process? Once we sit down and understand your preferences, we can indicate how long we believe it'll take. From experience we know we can build sites on average between 6 and 12 weeks, which is very fast comparing with the industry building the types of sites we build. As always there are exceptions tat confirm the rule, in both directions. We have delivered sites within one week, and others that have taken much longer than the average time. Both have their reasons and consequences. Ask us about your new site! CMS or Content Management System refers to the management of contents of a website. It's a system that allows you to maintain virtually all content elements of a website, such as texts, translations, images, menus, pages and blogs. In a CRM environment it's interesting to centralise also the management of contents into the same system as to have one central location to manage all your contents. Optima-CRM includes a custom CMS module where you manage the content of one or multiple websites created by us. This very powerful CMS allows you to fully control your website(s) from within the Agency Admin role of CRM. This allows you to maintain the existing pages and blogs, as well as add new pages and blogs in any language, as well as changing and adding menu items as you need. Furthermore you have all the tools and accesses from within the same module to optimise any page, blog or property for SEO. Who provides the contents for my website? You are the one who communicates to your audience, which means that the messages best come from you. We encourage our clients to provide as much contents themselves as possible. However we do have services available to create contents in various languages, especially to help with making a site contents SEO-friendly. Our content writers and SEO team are experts in those areas. And even when you provide the texts, we do offer assistance to review and advise you on SEO elements to be aware of within content elements. All our websites are created with SEO in mind and by definition are prepared for SEO. The vast majority of our clients opt for us to do their On-Site SEO which includes a whole series of activities in terms of page structure, keywords analysis, optimisation of contents, creation of Google Search Console account, prepare and implement 301 redirections and lots more. It's important to havea a website that can be SEO'ed + to do the actual On-Site SEO for any website. Hence we offer On-Site SEO as part of the website creation project. Furthermore we also offer the option to contract our Off-Site SEO services, which in combination with On-Site SEO will allow your website to climb in the ranking organically, and capture an increasing amount of visitors to your website. What types of web positioning are you handling? We offer both organic (SEO) and paid (SEM) website positioning. SEO starts with an intense exercise of On-Site work, whereas we redefine the code structure, implement canonical coding, provide ALT tags on relevant links and images, define H-tags, do keywords analysis, decide on the best-fitted search terms for your niche and target markets, optimise your contents, create accounts and tools such as Google Search Console, validate & solve potential issues, and much more. At the end of this exercise, your website is clean and ready to be ranked properly and much faster. A next activity focuses on Off-Site activities, where we focus on expanding your footprint on the large internet. We call this the creation of third party credibility, whereas other websites and internet authorities recognise you/your site as the expert in your niche. Here we apply a set f diverse types of organic link building. In many cases you want your website to be visible much faster than possible with organic positioning, whereas you have the option to reach page one of Google by paying for advertisement. Herefore we can create smart Ad campaigns that reach your objectives with the highest positive results, at the lowest possible cost. Furthermore we also deal with your social media campaigns if you like. How do I obtain a personalised FREE DEMO? Fill out our form and we will contact you! Time that suits you best: morning, midday or afternoon. If none of these options fit your schedule, you just have to select the option "Contact me" and we will call you or send you an email without any commitment to make an appointment. What does a FREE DEMO include? A truly personalised experience: Every demo is different and adapted to your needs and in a language you master. The better you explain your needs and wants, the more accurate we can prepare your demo, and the easier for you to make your decision. All your questions answered: Our demos are a two-way communication whereas you get to answers to all your questions about our CRM solution, how it integrates with your website, potentially a new site we create for you, financing possibilities available, data migration from your old system, and any other integration like portals for example. Clarity about CRM and website integration. We show you the functions in CRM that are instrumental for your business as well as what are the integration points with websites, how leads are automatically flowing into CRM etc. A demo user to get hands-on action. Once you understand the logic of our solution, you get to spend time on your own with your personal demo user so that you can further explore the rich features of Optima-CRM. Participate from anywhere: For your comfort and ease-of-access our demos are organised via GoToMeeting, a world-class web demo tool that allows us to share our screen with up to 50 participants from anywhere in the world, through PC or tablets, and with two-way conversation over the same connection. Alternatively we can provide a Spanish conference phone number.Prior to the start, we'll send you a link to click at the time of the demo. Yes you can test-drive the solution, upon completion of your demo. We'll create a test user for you in which you can investigate and become more familiar with Optima-CRM from anywhere at your own time. You can test as long as you need yet a test-user typically needs up to 2 weeks after the completion of the demo. We encourage you to make an educated decision whether our state-of-the-art solution is what your business needs to grow and win against your competitors. How can I contact the Support help desk? Ticket system: the best way to report a technical issue and get it resolved fastest. Email: you can also send an email to support@optima-crm.com for specific needs that cannot be handled via Tickets. Phone: our functional support team is available Monday to Friday from 9:00 to 17:30 CET at +34 952 770 306. Chat: it's also possible to contact our team via the website online chat box (optima-crm.com). Are there FAQ's and videos in Optima-CRM available? Yes - in Optima-CRM you will find a series of FAQ's and their answers to help you with some important things and settings. You can also subscribe to the Optima-CRM YouTube channel to access tutorial videos in English and Spanish. Is training included and what types of training is offered? The method applied for training is the Train-The-Trainer method where we form the key users of the company to become the expert within their users community. There are tow types of trainings, one for the System Administrator and another for the Users. You are entitled to two free sessions of trainings, included in your licenses fees at the start, one for the Agency Admin configuration elements, and the other for the User on how to best use the solution. After such trainings, our functional team continues to answer any questions you may have and help you on the way to get the best results from using Optima-CRM. For companies who would like additional training to be organised, we offer such services optionally as well.